Have you ever wondered what constitutes urban arts? How do they relate to street art? Or public art? Why has it become one of the most relevant movements of the last fifteen years? It is a particularly interesting artistic concept with a rich cultural history that originated inside small communities and local areas. Dealing with socio-political issues and at the same time going against the institutions of arts and capitalist ideas, urban arts flourished with the arrival of the Internet, through which it was possible to spread the word to an even larger public. As the community of like-minded artists grew, the movement did too, despite – or thanks to – its ephemeral nature, creating an outreach in confluence with its location and the people of that specific neighborhood or city. The Humboldt University of Berlin, one of the world’s biggest and richest urban arts playgrounds, will welcome a conference dedicated to this extensive topic and its influence on urban culture and life today, for two days only during the month of July. Perhaps we could describe urban art as something that started as “the writing on the wall” which then spread out to include an entire spectrum of artistic and visual interventions connected to open-air spaces. Encompassing an entire array of media and techniques used by the artists, like stickers, posters, graffiti and street artworks, yarn bombing and even entire installations and performances, urban art inevitably became a part of the evolution process of almost any given place. As such, it also became involved with other, similar aspects that directly concern its citizens, ones that determine the very quality of life in present and future times; topics like gentrification, as the re-interpretation of urban landscape, commoditization as advertising and city marketing or vandalism as the defacing of private property. What is clear is that we cannot ignore urban arts as an integral part of our culture and surroundings and a vital element of their further development. 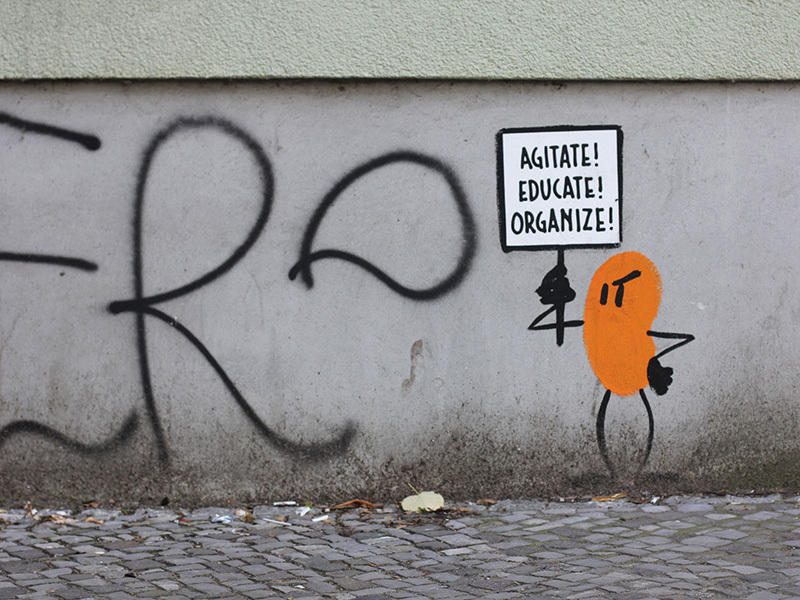 Hosted by Humboldt University Berlin, the Urban Art: Creating the Urban with Art conference aims to dissolve and examine all the aforementioned topics and more, in an effort to present its numerous possibilities, facets and contradictions. With special guests coming in from all around the world, the conference will also present a variety of panels, papers and workshops accepted through submission process which took place this spring. As a result, there will be an extensive program that will take place during two whole days. Saturday, July 16, for example, will be divided into four thematic series of discussions, dedicated to affect & performance, territories, urban imaginary & the city and networking panel. 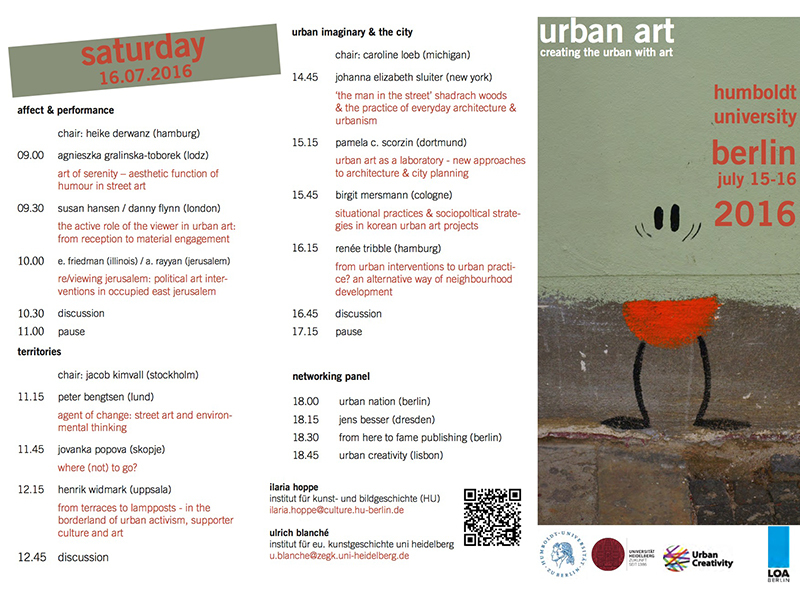 The participants will pose important questions in regards to, for example, the aesthetic function of humor in street art (Agnieszka Gralinska-Toborek, 9h), the active role of the viewer (Susan Hansen and Danny Flynn, 9.30h), the situation in East Jerusalem (E. Friedman and A. Rayyan, 10h), street art and the environment (Peter Bentsen, 11.15h), urbanism and architecture (Johanna Elizabeth Slitter, 14.45h and Pamela C. Scorzin, 15.15h) and Korean urban arts projects (Birgit Mersmann, 15.45h). The day will end with panels from four entities in the field, including Berlin’s legendary Urban Nation. On Sunday, July 17, the attendees of the conference can hear the talk with the director of the institute of art and visual history HU Berlin, starting at 14h, which will continue with a discussion on the terminology for public and urban art, featuring guests from Switzerland, Germany, the Netherlands and Portugal. 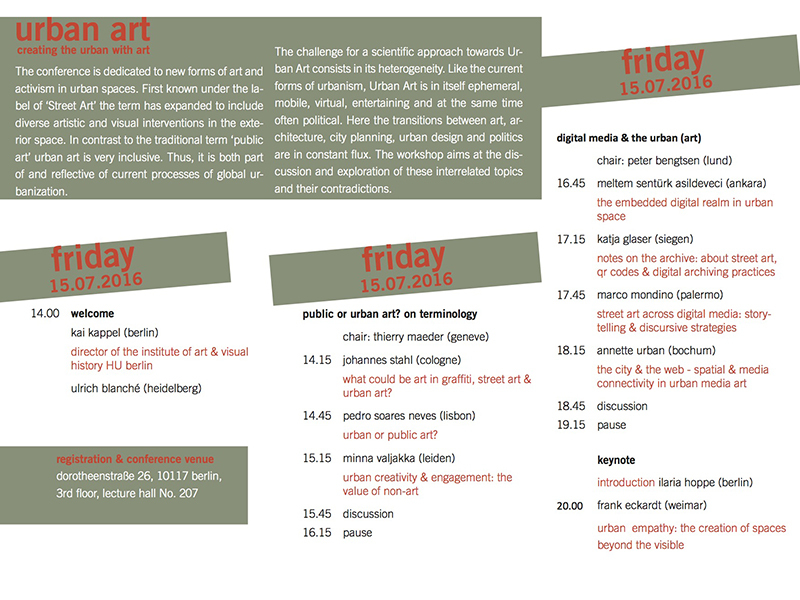 From 16.45h on, there will be a presentation on the influence and relationship between digital media and urban arts, with mentions of digital archives, story-telling and the web at large. Panelists include Meltem Sentürk Aslideveci, Katja Glaser, Marco Mondino and Annette Urban. The day and the conference will conclude with the keynote delivered by Bauhaus-Universität Weimar’s Prof. Dr. Frank Eckardt, who will tackle the creation of spaces beyond the visible, with the introduction by Prof. Dr. Ilaria Hoppe, from the Humboldt University. 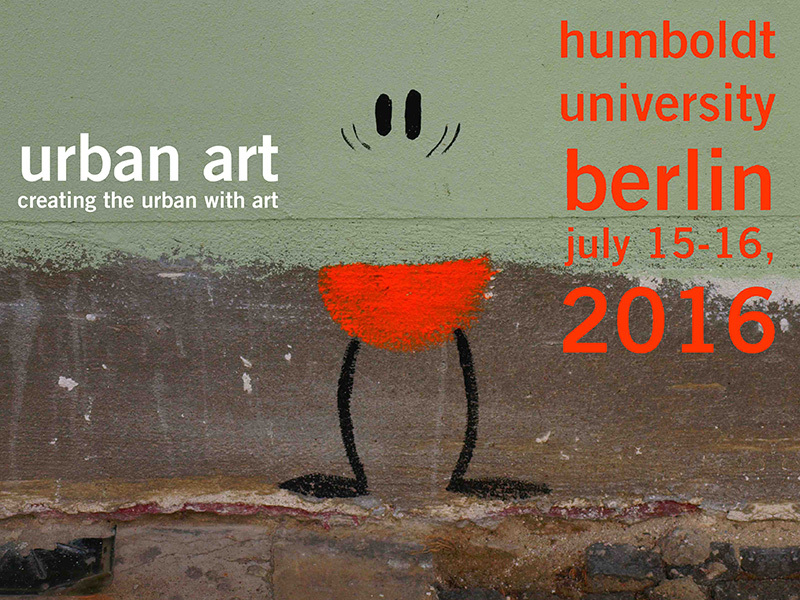 The Urban Art – Creating the Urban with Art conference will take place at Humboldt University, located on Dorotheenstrasse 26 in Berlin on July 15 and 16, 2016. The discussions will be held on the 3rd floor, lecture hall No. 207. The conference will be open to general public at all times and the entire program is in English.